Your Natural Diet: Alive Raw Foods is written by Dr. T.C. Fry and David Klein. The authors state that the natural diet of human beings was composed of raw fruits, vegetables, seeds and nuts and as such they advocate a diet composed entirely of raw plant foods. They assert that every nutrient we need is available in fruit and other plant foods. Additionally they say that cooking causes the production of toxins that can have a negative effect on our health. By following a raw food diet they claim that you will be able to overcome illness, achieve your ideal weight, gain more energy and restore your youth. The authors explain how cooking food causes the production of a variety of toxins as well as destruction of important nutrients. They present research to support the concept that the natural diet of humans is primarily fruit. However, they emphasize that this does not mean that fruit should be the only food that we eat. Your Natural Diet says that if you eat 70-80% fruit with the rest of the diet consisting of lightly cooked root vegetables and grains along with some raw nuts and seeds, this will not have a negative effect on your health. The authors offer dieters four major criterion to assist with the selection of the best foods in regard to promoting health. First criterion: Does the food taste good in its natural state? Second criterion: Does the food introduce harmful or toxic substances into our digestive system? Third criterion: Is the food easy to digest and assimilate? Fourth criterion: Does the food contribute a broad range of nutrients? The Natural Diet includes guidelines and suggestions for gradually transitioning to a raw food diet. Food combining is also explained and is recommended to enhance digestion. Bananas, dates, figs, grapes, melons, oranges, kiwis, avocado, lettuce, tomato, cucumber, sea vegetables, sprouts, nuts, seeds. Your Natural Diet recommends exercise because it makes the dietary transition much easier. It also improves will power, digestion, and elimination. The authors advise dieters to exercise vigorously at least twice daily to create true hunger. 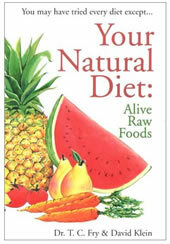 Your Natural Diet: Alive Raw Foods is also known as Raw Revelation and retails at $12.95. Encourages a high intake of fruit and vegetables. Will reduce the risk of chronic illnesses such as heart disease and cancer. Offers advice for transitioning to a raw vegan diet. Acknowledges the psychological factors involved in overeating. Encourages a holistic approach to good health. Many dieters do not do well with such a high intake of fruit. May not provide adequate amounts of protein and certain minerals to suit the needs of many dieters. Most dieters experience some degree of discomfort such as headache and fatigue in the initial stages of adjusting to a raw food diet. Food combining rules may be overwhelming. Some of the information in the book is outdated. While most people can benefit from eating more raw fruit and vegetables, many dieters do not thrive on a diet that is based primarily on fruit. Your Natural Diet will appeal to dieters who are interested in learning more about a raw food diet but should be supplemented with more up-to-date reading material that addresses recent advances in nutritional research.